The Microsoft Surface Pro, the higher model version of the earlier released Surface RT, is set to hit stores in early February. 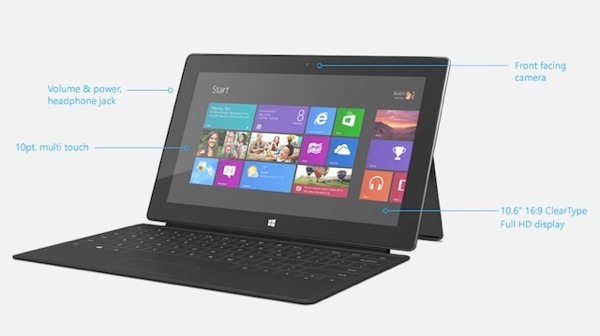 This new tablet will run Windows 8, which unfortunately also takes up 64% free space on the entry 64GB model. Wait. What? So the 64GB Surface Pro ($899) will only have 36% of its advertised storage available and the 128GB model ($999) will only have 65%? Of course, Microsoft says users can create a backup bootable USB and delete the installed recovery partition to reclaim used space. Microsoft stressed to AllThingsD the Surface Pro’s USB 3.0 port and microSDXC slot should rid storage woes users may encounter. So what is the Surface Pro? A tablet or a notebook? Does Microsoft expect users to lug around external USB hard drives, USB sticks or microSDXC memory cards for extra storage? At least it has that awesome ‘clicking’ keyboard (wait–that costs an additional $120-$130 depending on model). There’s nothing better than spending $900 for 23GB of free space on your Surface Pro, which has half the battery life of the Surface RT, is 43% thicker and half a pound heavier. Nothing else much to say here other than “Oh, Microsoft.” You can’t make this stuff up. Earlier today, Apple conveniently timed its announcement of the availability of a 128GB capacity iPad 4 starting at $799, coming in February.